Tips for parents with children who learn differently. Summary of talk by Claudia Koocheck, Head of School at Charles Armstrong, in Belmont, CA, Friday, September 24th, 2010. The first speaker of the 2010-11 PEN (http://www.parentseducationnetwork.org) Speaker Series in San Francisco, Claudia Koocheck, focused most of her remarks on the role of parents whose children are learning challenged. She speaks from first-hand experience as Head of School at Charles Armstrong, a much respected Northern California independent elementary and middle school for students with learning challenges. One facet of her responsibilities is meeting with parents on a continuous basis giving them support while challenging them to move into new paradigms to support their children through the schooling process. Parent’s reactions after learning a child has a learning challenge. Ms. Koocheck talked about parent’s shock after discovering that their child has learning differences. It’s a hard fact to absorb and especially true when parents have specific goals for their children emanating from the time of their offspring’s birth. The child they pictured is turning out not to exist.Parents become confused and upset. Ms. Koocheck understands as she helps them walk a new and unexplored path. One of the first steps in this journey is encouraging parents to think beyond themselves and their needs. Now is the time to accept their children as they are and to put emphasis in collaborating with the teachers to achieve the best results for them. Most parents want an academic path for their child. This step may be achievable but not in the traditional way. A learning challenged child’s brain learns differently which can mean some kids don’t test well. Often parents lay the fault with the academic environment mostly because they don’t know how to help their child. Sometimes parents resort to hiring a tutor or a coach hoping these steps will solve everything. It does, in some cases, but not the total answer. A Fixed Mindset from a parent or child derails progress. This behavior can be best expressed when a parent is focused on how good their child is academically or more tragically, when a child thinks he or she is stupid because they can’t master the traditional schooling process. The goal for parents and learning challenged children is to develop a Growth Mindset, one that opens doors to new approaches. It is much more important for the child to learn something in a class than to get the best grades. This means focusing on the process, not the results. It’s about effort, not about the outcome. The child wants and needs to enjoy learning. It may come from an unexpected way like a child drawing pictures to understand what they are learning. So be it. Invest effort in helping the child discover and move from some skill they are good at. Movement, music, art can be an effective tool to help a learning challenged youngster learn. Learning challenged children read information in a different way: through tone of voice, body language, etc rather than intellectual information. Ms. Koocheck gave an example of a child coming home from school, feeling sad and not having the words to say what is wrong. It may be that at school they realized as a result of the teacher’s behavior, not words, that they are different from everyone else. They are perplexed because but don’t know why. Keep reminding your child that he or she is smart by asking, “how did you do that?” This question gives the child a chance to digest what he or she accomplished while experiencing the joy of sharing the success. Note: the phrase, “great job” doesn’t have the same affect. In fact, it may have the reverse. It may not be a “great job” in the traditional way of mastery and learning challenged children know that! Kids don’t know what they need until you show them. Give them options. Children have a challenge asking for what they want. To make her point, Ms. Koochek used the analogy of an adult deciding he or she will ask for raise and all the fears and hesitancies that come with that decision. The same is for the child. Be sure to provide a safe environment for the child to open up. Then ask: “what do you want to say to me?” Remember: it is the parent’s responsibility to teach their child how to address another and to ask for what they need. After providing a safe environment consider these three possible communication tools to help a child share how they are feeling. Sticky notes: one with a thumbs up and one with a thumbs down. Face charts with many different emotional looks along with a description of each is each useful. Ask the child to point at the face on the chart that best describes how they are feeling at that moment. Ask questions. Ask the child to raise their hand when the response is correct. The goal is to get to the point where the child develops a sense of ownership. It will only happen in a safe environment. Remember the learning challenged child comes from a sensorial point of view. They read body language and tone of view before anything else. Don’t correct the children’s homework. If you do the teacher will never know where the child is struggling. As part of Ms. Koochek’s presentation she suggested parents learn what it feels like to be a dyslexic. The Northern California Association of the International Dyslexic Association offers a dyslexic simulation process where parents can demystify themselves. The next simulation is Saturday, Oct. 16, 2010, 9:00 am-12:00 pm at the San Francisco Day School, 350 Masonic Avenue, San Francisco, CA 94118. 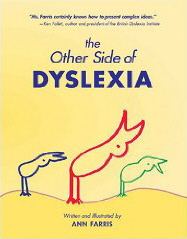 For more information go to www.dyslexia-ncbida.org. Ms. Koochek had much more to say. In summary, she encouraged teachers and parents to foster resilience in the child. The desire end results are 1) self motivation, 2) self direction, 3) self advocacy, 4) emotional well-being, 5) social connections and skills, 6) self awareness 7) Self control. And, parents, remember, applaud teachers and their efforts. They want your kids learning and you happy. Mindset, The New Psychology of Success by Carol Dweck, (2006), Random House Publishing Group, New York. It describes how kids perceive themselves. Brooks, Robert and Goldstein, Sam (2003), The Power of Resilience: Achieving Balance, Confidence and Personal Strength in Your Life. New York Contemporary Books/McGraw Hill.